Test Environmental Chamber is an accessory for the Tensor Check, which permits to perform tests with controlled temperature between -40°C and +250°C. The Environmental Chamber without a refrigerating unit allows testing between room temperature and + 250°C. The refrigeration unit, which can also be installed after the purchase of the Chamber, makes it possible to extend its use at low temperatures and to perform tests between -40°C and + 250°C. - check the test temperature perfectly, avoiding oscillations that may alter the results. - having to manage the recharge of the nitrogen tank. The Climatic chamber can be equipped with an internal differential strain gauge for measuring the temperature-controlled differential elongation. The strain gauge complies with the requirements of ISO 5893, has a resolution of 0.01mm and a total stroke of 400mm. The strain gauge can be moved to the bottom of the chamber for testing that does not require it. The digital linearization of the elongation reading guarantees extreme measurement accuracy over the entire stroke. 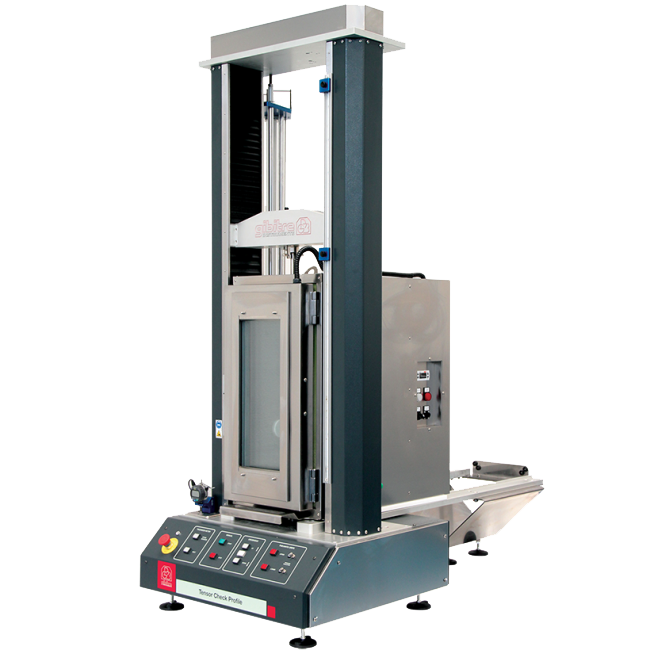 The Environmental chamber is positioned on aluminum guides and can be easily moved back and forth to perform tests with or without temperature control.